Oh, my brain feels too tight in this heat. They're talking about 34, 40C (104F) with the humidex. You know, I think I preferred it when I just knew it was hot according to the temperature. Do I really need to know it's actually hotter than I think it is. And according to Environment Canada the UV index is a 9, which means I'm probably double dosing my Vitamin D that I took this a.m. just by thinking of standing on the front stoop. Fortunately the garden looks much better than I do. Some of these photos are from a couple of weeks ago, some from today - trying to catch up a bit to show you what the garden has been doing. On a good note, the mild winter has been a real bonus for so many new plants I tucked in last year. On a fright-note, I saw my first Japanese Beetle yesterday, may his family be small and not as hungry as last year. Newish plant - Spirea 'Double Play Big Bang' - a trial from Proven Winners is doing great. Very fuzzy-wuzzy. Reminds me of an old friendly blanket. Planted in 2010. The American Daylily Association used to include Canadian gardens in trials. Unfortunately they've stopped. This sweet little daylily is the first to bloom in my garden - it only had a number, no name when I planted it. 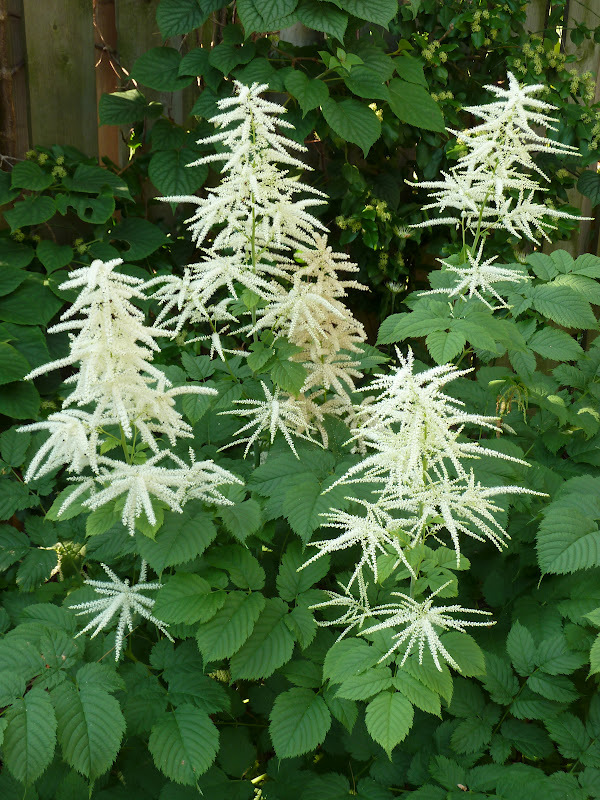 The Aruncus dioicus is smaller this year. The lack of rain in May really slowed it down. But, still looks good, even though it isn't as large as in years past. The Allium are finishing up. New Go Go (TM) begonias from Loblaws (photo taken last week) - doing really well - although today, will have to get the water on them, you can practically hear them scream for help. I haven't had a good black velvet photo in a while. 'Brothers Grimm Fairy Tale' Florabunda Rose is one of 5 that I'm trialing (Palatine)- and I believe my favourite. 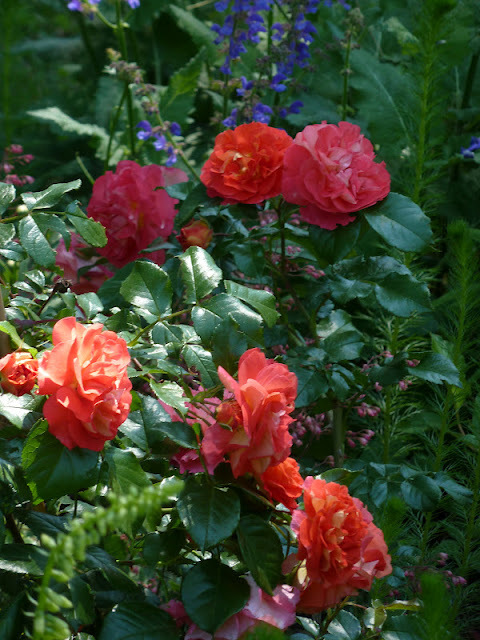 Clean foliage, pretty colour, over-the-top rose scent. 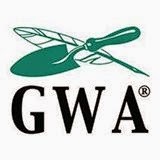 I do nothing but pull off the odd bug, cut them back in the spring and water when necessary. Starts orange with yellow, goes pink. So very lovely. 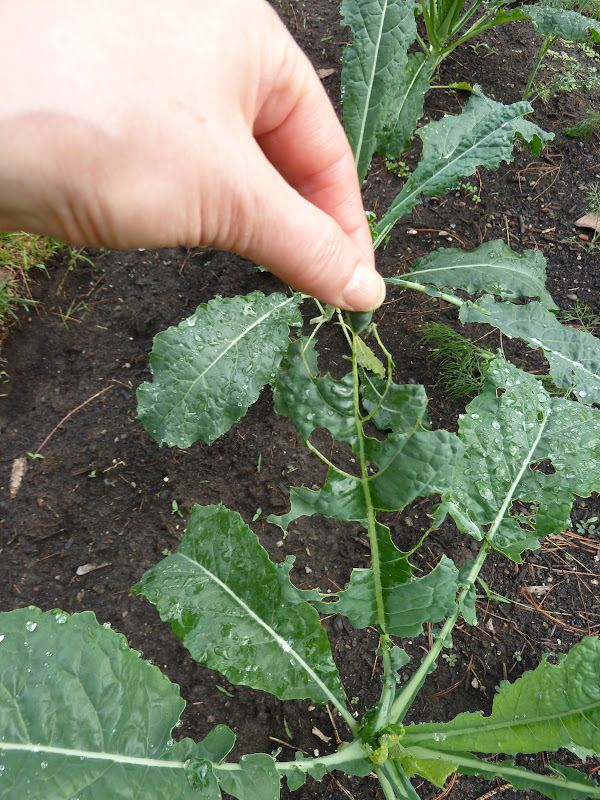 The kale are looking much better this week, but last, there was someone who was very, very hungry. The clemmies are excellent this year. Every other year when the digitalis blooms, I swear I should plant more seed. Going to hunt through my seed box to see if I might have a package hanging around. More dragonflies this year than last. My brain is sore, back to 'Brothers Grim Fairy Tale' before they turn pink. This is a photo of hope. I collected seed from a fellow gardener in South Carolina a couple of years ago, and I've got a few little sprouts. 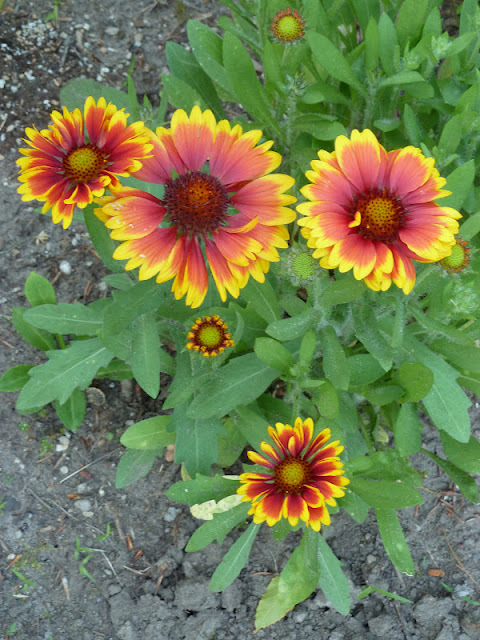 Are they Gaillardia aestivalis van Winkleri? I do hope so. This plant has a white flower with a purple/bluish centre if I remember correctly - quite unlike the gaillardia I've got growing everywhere else. The Oakville Garden Tour was on Sunday past. Just 6 gardens, would have like to have seen more....there are many brilliant Oakville gardeners out there, let's hope more step up to be on the tour next year. This very shaded garden on Holyrood was on the tour. But, if you walked down the street you got to see one of the best trees in all of Oakville - isn't it fabulous?! Brain officially not working, more 'Brothers Grimm Fairy Tale'. There have been so many new creatures visiting the garden this year. I really think the pesticide and fungicide ban has helped them along. 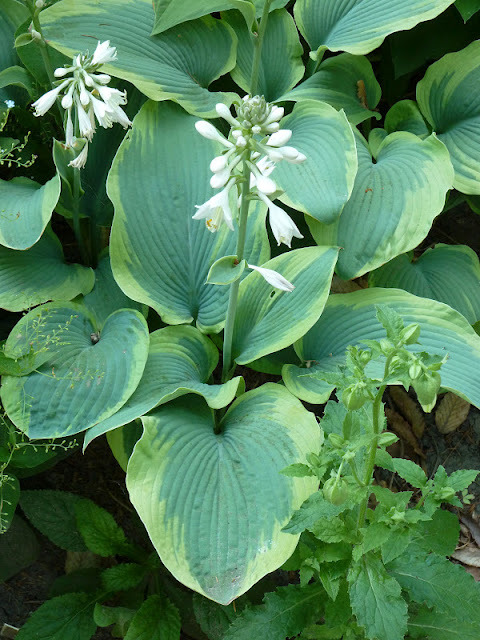 The early hosta are starting to bloom. There was a point when I was planting my hosta when I wasn't all that careful with tags - sadly - because I'd definitely recommend this nice big blue one. Now here's a plant I really wasn't too fussy about when I was given it to trial. Something about the colour of pink that didn't sit well with me. Also, before the blossoms emerge, it looks as if the plant is suffering from lack of water and the buds will never open. I'm making a complete about-face on Endless Summer Bella Anna - I like it, I really do. 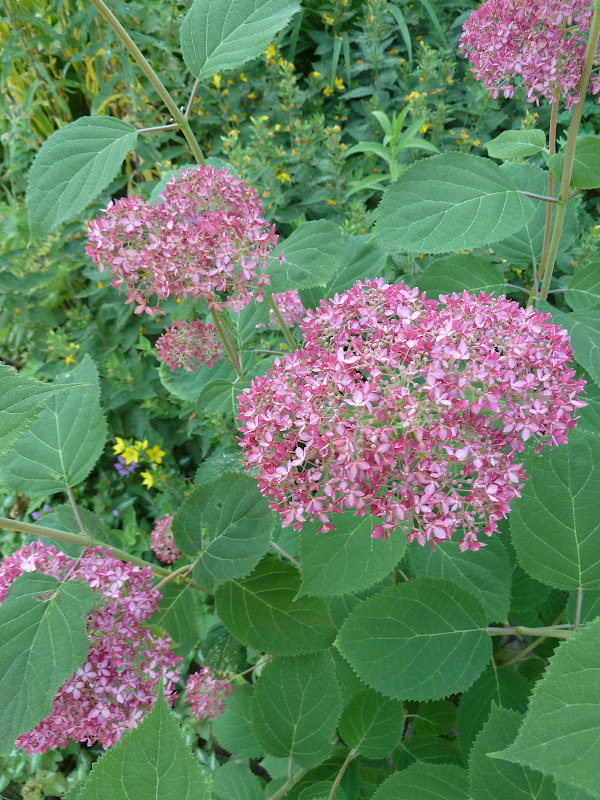 It's an arborescens hydrangea. 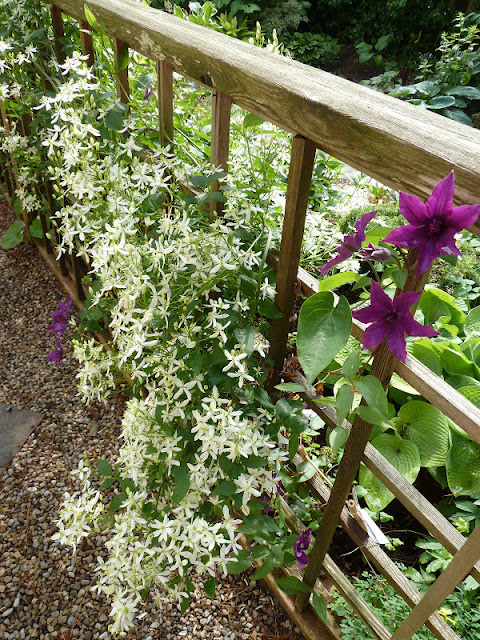 Blooms on new wood - always good with our winters and is holding its blossoms nice and straight. The colour is even starting to grow on me. 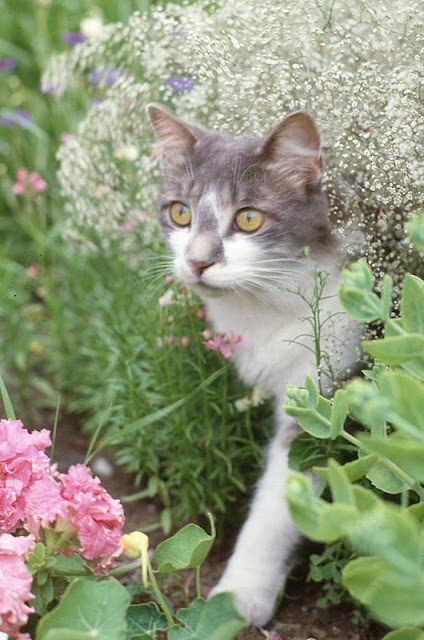 Here's a little blast from the past - a dear old kittie Fast Eddie who has long left this earth in my first garden back in Toronto. I've been going through my old slides and scanning them like a fool. It really put a smile on my face remembering that day in the garden with my sweet little kitten. Yikes...that weather sounds truly intolerable! Still, at least the garden looks fab!